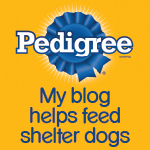 Blogpaws sponsored by Pedigree is sponsoring a "Write a Post-Help a Dog Blogaround" Please visit my pals Dozer and Coop @ Our Life: Dozer and Coop for the best information. For every blog post about the campaign between now and June 30th, Pedigree will donate a 17 pound bag of food to a shelter. One bag per blog so the more of us that do it , the more tummies that get filled up. So please copy these badges and join the blogaround! What a great idea! Thanks Sasha to the linky and Dozer and Coop for all the info! Ruby, I have to say, you've acclimated yourself to Blogville very quickly! It is a pawesome program! We are having some issues at home now but I hope I can make a post! Pawsome Rubie, my sweet sweet pal!!!! High paw to you and BOL BOL BOL, Rubie is the greatest pal!! Well done Ruby, they will have lots to eat when Blogville comes to the rescue! Hi Ruby ... it's nice to meet you! 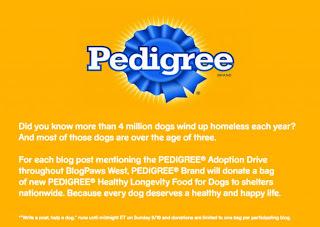 You are doing a good thing with this -- I sometimes forget how lucky I am that my tummy is always full! Thanks for the good info, Ruby! It's a great program for sure!